HOW THEY LOOK NOW. 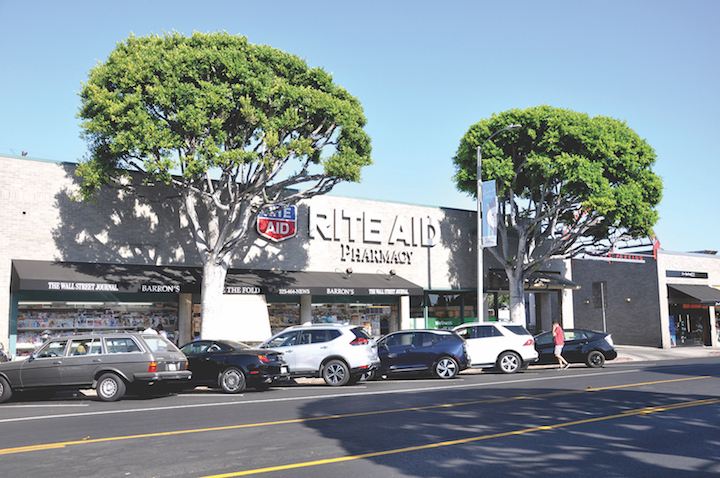 The request to remove the two healthy trees was submitted by Beverly Hills developer Ronald Simms, landlord for the Rite Aid on Larchmont Boulevard. Alas, attempts from residents and community groups to save two side-by-side mature ficus trees on Larchmont Boulevard have failed as city officials confirm the trees’ imminent demise. Councilmember David Ryu’s office announced Oct. 23 that two separate city agencies have assessed the site at 226 N. Larchmont Blvd. and approved the trees for removal. 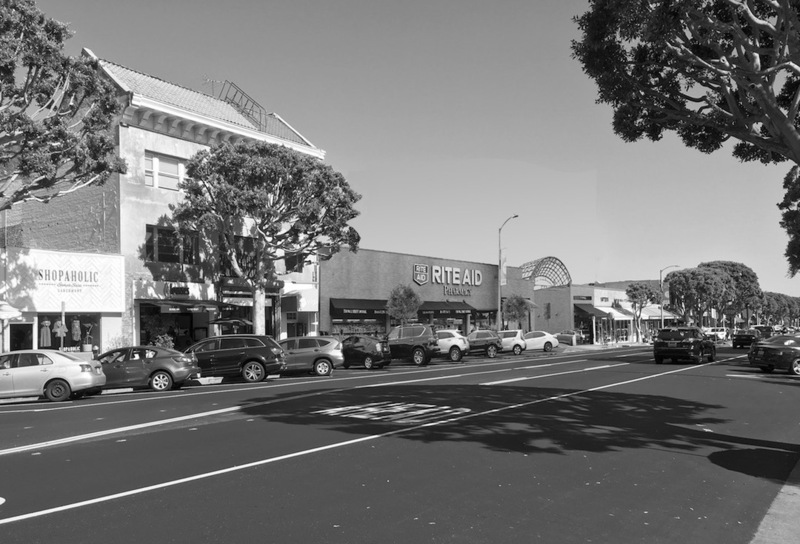 The original request to remove the two healthy trees was submitted May 15 by Beverly Hills developer Ronald Simms, landlord for the Rite Aid on Larchmont Boulevard. Once the request was made public, local residents expressed outrage at the prospect of losing two prominent trees, which help provide a lush canopy and unique ambiance for the shopping district. The Windsor Square Association (WSA) was quick to oppose the trees’ removal because they are not dead, diseased or dangerous. Association president Larry Guzin said of the request that it is “unreasonable” to remove the two trees as there has never been a claim against the city or property owner on account of the sidewalk, which he says is still in “okay” condition. REVISED “future” rendering, above, shows the site without the ficus trees. With the WSA’s opposition in mind, the Chronicle asked Coucilmember Ryu to explain his decision to support the removal request.“At my urging, the city’s Department of Disability and Urban Forestry divisions both studied the site outside Rite Aid, and both came to the conclusion that the sidewalk was not ADA (Americans with Disabilities Act) compliant, and that further root pruning of the mature ficus trees would not be possible without killing the trees,” Ryu explained. It should be noted, however, that the WSA orderly street tree replacement plan calls for the two trees in front of Rite Aid to not be replaced until 2023 and 2025 respectively. But more on that later. “It’s hard to be a street tree,” says Diana Zogran, environmental health committee chair for the Neighborhood Council Sustainability Alliance, who notes that this tree removal process echoes what is happening citywide. “What’s disturbing about this removal approval, and the approach thus far to removing trees on Larchmont Boulevard, is that it is being piecemealed. Neither the trees nor the community get their due process,” said Zogran, who explains that removal requests for two trees or less don’t get a public hearing, which means the community never gets a chance to express opposition or discuss alternatives. “When residents are included in the decision making process, we get more environmentally superior projects,” she stressed. Why is it important? Zogran says that trees are the leading resource to fight climate change and air pollution. “You cannot have a healthy city without having a healthy tree canopy,” she warns. In an attempt to stop such piecemeal decisions in the future, the WSA is seeking support from partner community groups on an Orderly Street Tree Replacement (OSTR) plan. The plan calls for the selective removal of a few trees at a time, over a 20-year period. Repair of the surrounding sidewalk would take place when the new trees are installed. The WSA argues that, this way, the early replacement trees will have a chance to grow before all of the older ficus trees are gone. The next step of the process is for the OSTR plan to be refined with community input. Once finalized, the plan will need to be supported by the other stakeholder groups including the Larchmont Boulevard Association (representing merchants) and the Larchmont Village Business Improvement District (representing property owners), plus the Councilmember’s office. Visit windsorsquare.org for more information on the WSA OSTR plan. If all of Larchmont was assessed according to ADA compliance, just about every tree would have to come down. It’s so cynical of hte landlord of the RiteAid building and Councilman Ryu to use the Department of Disability that way. The Rite Aid will be an eyesore without tree cover for their ugly sign, and the street will lose two mature trees. I do not see why they feel that they need to jump ahead of the Windsor Square Association plan!